Credit Card: Pay by credit card via PayPal. A $50/student convenience fee will be added to tuition. (Yes it’s the page that says Donate to BJEP). Smart Tuition charges a 2.85% fee for credit card or debit card payments, which is set-up directly with them. There is no fee for payments made through bank withdrawals. Smart Tuition also charges a $48 per family yearly enrollment fee. Pay in installments via Smart Tuition (with tuition paid in full by December 31, 2019). A non-refundable and non-transferable deposit of $250 per child will reserve a place in the class with registration. If you have any questions including questions about setting up Smart Tuition please contact Adina at Adina@bjep.com. STEP 5: Please email a family picture with the names of those pictured to info@bjep.com. We want to get to know you and your family better and be able to recognize members of your family who are currently attending BJEP and those who are not. BJEP families come in many shapes and sizes, so if your family has step-parents or 2 sets of parents, please email more than one picture. The pictures are for internal use only and will not be put on social media or be used for publicity. 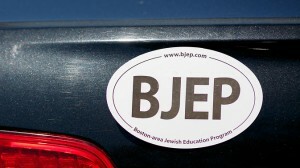 You have earned your very own BJEP car magnet!